Developer Quote: "Pinterest is a Virtual Pinboard which lets you organize and share all the beautiful things you find in your life." 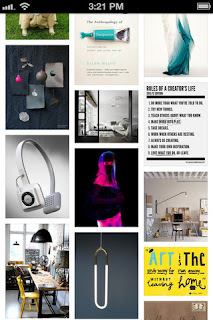 • Browse pins from people and pinboards you follow. • Repin, like and comment on your favorite pins. • Pin with your camera! 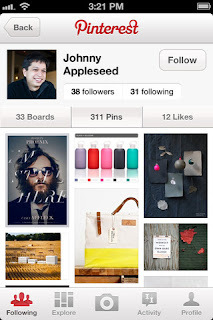 How are some of the ways you can utilize Pinterest? Well, I thought about this for a while and can see some excellent uses for it. You can use a Pinterest board to decorate a house, plan an office party, baby shower, family vacation and so much more. Paste your images in your area of interest on your wall, and write your thoughts under that graphic. So, if you're planning a party, invite friends to give you their recipes, pics, games, themes or anything at all to do with the event. You can post this info on your board, or have your friends do it themselves. If your kids are part of a soccer or basketball team, post team pics, scores, game news or anything else at all. Can you see now how useful a social networking tool Pinterest can be? So go ahead and get started fleshing out all your areas of interest on walls that reflect your thoughts! It's a great way to stay in touch with friends!